From the Great Pumpkin Ball to ghastly ghost tours and decoration crafting workshops, there's enough going on in and around Montreal this October to keep the family knee-deep in Halloween frights and fun all month long. If you're traveling to this southern Quebec city with your kids for Halloween this year, be sure to check out all Montreal has to offer during the spooky holiday. Whether you're looking for the ultimate costume or the best place to go trick-or-treating in the metro area, you're sure to find it Montreal this October. While supermarkets across the city carry pumpkins all season long, there are plenty of opportunities in and around Montreal to visit a farm and make an event out of picking out your pumpkin this October. Both Pumpkins patches and public markets near Montreal offer unique ways to enjoy the fall season with your family. If you have a car, you can head out to the Château Ramezay for its annual Pick a Peck of Pumpkins event, which includes free admission to the estate on weekends in October. During the event, kids are invited to follow a series of clues to solve a pumpkin mystery, and on Sunday afternoons, the whole family can share a pumpkin-themed brunch in the estate's restaurant. If you don't have a car, you can simply take the Montreal metro to one of the city's local public markets instead. Marché Jean-Talon is a great choice that's just five minutes from the nearest metro station and offers complimentary fresh fruit samples, affordable treats, and a wide selection of locally-grown pumpkins. Every year, Esmerelda the Witch appears at the Montreal Botanical Garden to judge a few hundred pumpkins at the Garden's annual pumpkin decorating competition, the Great Pumpkin Ball, which runs from October 5 to 31, 2018. Meanwhile, at the Montreal Insectarium nearby, you can spend the "Spiders Unmasked" exhibit, which features a series of kid-friendly activities throughout the month that teach children that while spiders may be creepy, they're extremely important to the environment and local ecosystems. It usually only takes a few hours to explore the Botanical Gardens and Montreal Insectarium. If you're traveling with younger children, you should plan your trip around sundown to ensure they are still enjoying the attractions by the time the jack-o-lanterns are lit at night for the Gardens of Light event. 2If you're looking for a family-friendly day trip near Montreal, consider driving out to the Canadian countryside to visit Ouimet Farms Adventure. This activity-filled farm offers guests the chance to explore seven acres of labyrinths carved through cornfields as well as access to a pumpkin patch, zip line courses, a go-kart track, hayrides, a burger shack, and a "jumping pillow" for kids. Ouimet Farms Adventure is located right by the Quebec border in Vankleek Hill, Ontario, and is open each year from the first of August to the last weekend in October. Additionally, if you visit the farm at sundown on the first three Saturdays in October, you can venture through a special night maze, and if you come on Friday and Saturday, October 26 and 27, 2018, you'll be treated to a spooky haunted corn maze instead. Located on St. Helen Island, La Ronde Amusement Park was first opened to host the 1967 World's Fair. Now, on select evenings in October when the clock strikes 6 o'clock, this Six Flags theme park transforms into a Halloween wonderland filled with scare zones, zombies, ghouls, and haunted thrill rides for its annual Fright Fest event. Fright Fest in 2018, "Fright By Night," welcomes the addition of the Evil Circus, a creepy old carnival funhouse haunted by murderous clowns that features state-of-the-art 3D blacklight technology. Other frightening attractions include District 510, a medical experiment base; The Cursed Farm, a family farmhouse haunted by scarecrows; and Nightmares, a demented walk through otherworldly terrors. Scare zones include a zombie camp, an area for demons, and a vampires' lair. In 2018, the Fright Fest event will take place from October 6 to 28 and is not suitable for children 12 years and younger. Access to Fright Fest is included with regular admission to the La Ronde, with prices starting at $58. However, special group rates and season pass discounts are also available. Each year, a horde of the walking dead gather at Place du Canada in Montreal's Quartier des Spectacles for the annual Montreal Zombie Walk. In 2018, zombies will gather from noon to 3 p.m. on October 27 for the event. During the zombie meet and greet, the Rockabilly band Black Moon Boys will be playing a set from 2 to 3 p.m. to motivate the undead to move. At 3 p.m., the horde will depart down Sainte-Catherine Street West between Peel and Jeanne-Mance Streets. ​Afterward, you can join up with other costumed friends for drink specials at nearby bars and restaurants. 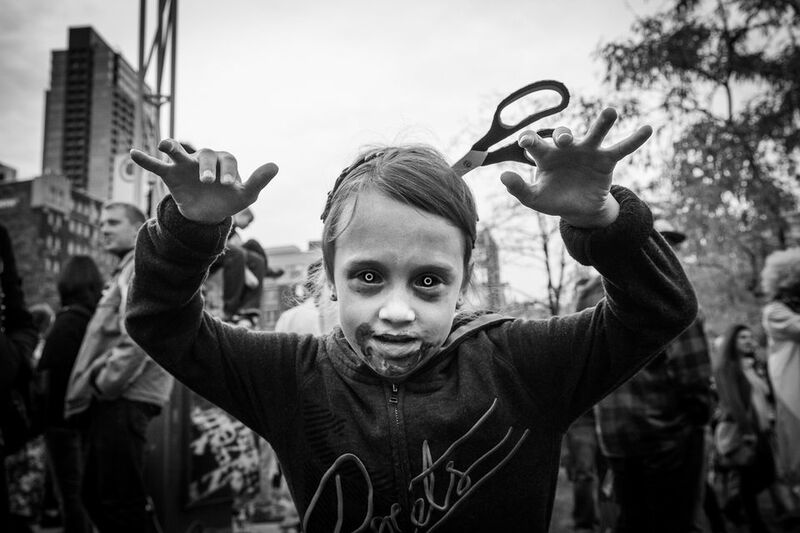 The Zombie Walk is appropriate for all ages, but you'll need to head to a family-friendly restaurant after the event if you hope to continue the fun with your kids. If you're looking for a fun yet thrilling way to discover the haunted history of Montreal, you can enjoy the crisp autumn weather on one of Old Montreal's Ghost Walks that run every Saturday of October. The Fantômes Montréal Ghosts company will offer individual guided tours of some of Old Montreal's most-haunted locations on Fridays and Saturdays from September 1 to October 20, 2018. In addition, every night from October 25 to 31, you can take the Montréal Ghosts’ Halloween tour, which adds a few extra frights along the tour route. If you'd rather venture off on your own to find a ghostly encounter, you can head to Mount Royal Cemetery adjacent to Mount Royal Park for an afternoon stroll through the fall foliage. If you head to the cemetery around sunset, you might even catch a ghostly apparition hanging out amongst the graves. Each year, the Orchestre Symphonique de Montréal (Montreal Symphony Orchestra) presents a series of concerts in honor of the Halloween holiday. In 2018, you can catch three performances at the Place des Arts's Maison Symphonique (Symphony House): "A Symphony of Horror" on October 30 and " Halloween Atmospheres" on October 31 and November 1. The "Halloween Atmospheres" concert features music from Ligeti's "Atmosphères," Dukas' "The Sorcerer's Apprentice," Liszt's "Totentanz" ("Dance of the Dead"), and Bartók’s "The Miraculous Mandarin." Meanwhile, "A Symphony of Horror" features Thierry Eschaich on the Grand Orgue Pierre-Béique accompanying the Orchestra in playing the score to the 1922 French silent horror film "Nosferatu: A Symphony of Horror." Children aged 4 to 10 years old can enjoy a special treat at the Pointe-à-Callière Museum, which is also known as the Montreal Archeology and History Complex, on October 27 and 28, 2018. "Strange Ghosts of Pointe-à-Callière" invites young guests on a guided tour of the Museum's archaeological exhibits featuring an original narrative by French children's book author Simon Boulerice.